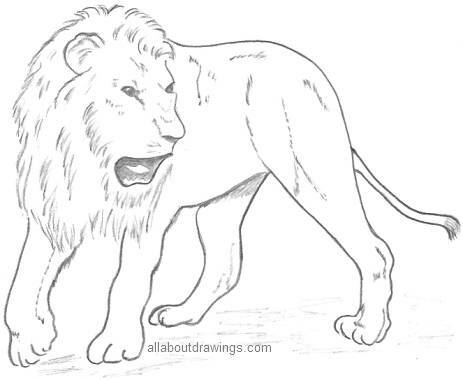 These lion drawings are easy to copy because they contain the basic lines needed for portrayal. All the images you see here were completed in my first year of teaching myself to draw. They are not excellent but I wasn't expecting to produce fine artwork. They are meant to show you what is possible when you try. Even if this isn't your favorite subject, grab a piece of paper and see what results you can achieve by copying an image that looks do-able to you. Really, for degree of difficulty, I found this to be an ok topic when I was first learning to draw. My results did surprise me so you have nothing to lose by trying it out. The exception would be the face -- faces take a little while to master so that challenge rests on the backburner for me. However, I figure if I can draw a lion, then so can you. All you have to do is have an attempt and let your pencil do its work. Just lightly sketch in some thin lines (or use the side of your pencil) to give the impression of muscles and shading. As you get more confidence, you will want to move on to learning how to do all different effects. are large, powerful, tawny colored wild cats. live in a family group called a pride which can consist of up to about 35 of them. hunt for hoofed animals such as deer, antelope and zebras. They live in areas where those animals are found and also near a water supply. roar or leave a scent to warn other animals to stay out of their territory. 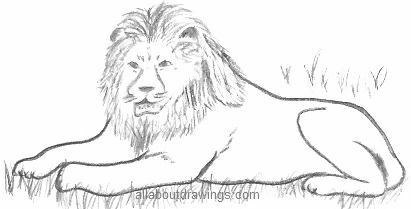 In the above image, I drew a lion resting after a meal. A large meal can satisfy them for days. Male lions have a mane of long thick hair that covers their head, down to the shoulders and chest but it doesn't cover their face. The lion is built for strength rather than speed and the mane makes him look bigger than he really is. Their coloring helps them blend into their surroundings. They are similar to the color of dead grass, so they can sneak up on their prey without being seen. can live up to 25 years old. Female lions, called lionesses, are smaller than the male and have no mane. They do most of the hunting because they have to feed the cubs, too. Nature really is fascinating, especially when you learn about those innate camouflage qualities. Whenever I browse through books and magazines, I always keep a watchful eye for images that look easy to copy. I love copying from other artists' because I enjoy observing how they create the structure and how to illustrate certain effects. Continuously draw outlines until you are satisfied with the resulting image. 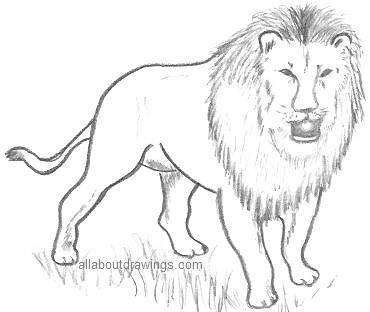 Once an outline is correct, it's fine to complete the lion drawings with shading and some details in the face. then there is my favorite method -- to simply draw what you are seeing. I don't care if a drawing doesn't work out, the point of the exercise is to progress with as much practice as possible. With every mistake, there is a lesson to be learned. Remember to scribble a bit of shadow on the ground to give a nice stability to the image. The shadow (or table line as it's sometimes called) makes your subject look more realistic. I regret I didn't know to use grounding lines so learn from my mistakes and make it a habit from the start. This lion drawing is my favorite on this page, it was the last one I did so it shows the little bit of practice beforehand really did help me in the end. Your artwork is unique to you and you will improve with practice.